God created the marriage relationship to be permanent. Too often today people enter marriage with a "we'll see how it works" attitude. At the first sign of trouble, they are ready to run their separate ways. Two people living together are going to face challenges. They are not going to always agree. They are not going to always want the same thing. But that's not the time to run. That's the time to talk. To God. To each other. That's the time to build the kind of unity we discussed yesterday. That unity will help prevent Satan from driving a wedge in the marriage. 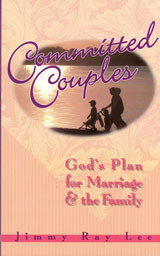 The Bible is filled with ways to make your marriage permanent. Here are just a few. When you have forgiven, put the issue behind and move on. Compliment each other regularly. Speak with kindness. Love each other the way God loves us. Honor and respect each other. Guard your heart—your thoughts, your attitudes. Keep Christ at the center of your marriage and home. Father, help me to be the wife/husband you want me to be. In Jesus' name . . .